In September 2016, France Football announced that their partnership with FIFA for the FIFA Ballon d'Or award had come to an end and that they would revive the Ballon d'Or award, treating the 2016 edition as the 61st award. France Football announced that they would publish a shortlist of 30 players across six announcements with two hour intervals on 24 October 2016. 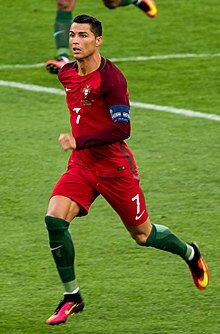 On 12 December 2016, Cristiano Ronaldo won the award by a record margin of 429 points ahead of second placed Lionel Messi and Antoine Griezmann, who came third. There were 173 voters. All were journalists, in a change from previous years, and each voter was from a different country. Each voter voted for three players who received 5 points, 3 points and one point respectively. ^ "Nouvelle donne pour le Ballon d'Or" (in French). France Football. 16 September 2016. ^ "Ballon d'Or France Football 2016 : rendez-vous à partir de lundi matin à 8 heures sur FF.fr et dès mardi dans FF pour découvrir la liste des 30 nommés" (in French). France Football. 24 October 2016. Retrieved 24 October 2016. ^ "Cristiano Ronaldo wins Ballon d'Or for the fourth time". Guardian. 12 December 2016. Retrieved 13 December 2016. ^ "Ballon d'Or France Football : de Sergio Agüero à Cristiano Ronaldo, voici les cinq premiers nommés de la liste des 30". France Football (in French). 24 October 2016. ^ "Ballon d'Or France Football 2016 : De Kevin De Bruyne à Gonzalo Higuain (2/6)". France Football (in French). 24 October 2016. ^ "Ballon d'Or France Football : voici la troisième partie de la liste des 30". France Football (in French). 24 October 2016. ^ "Ballon d'Or France Football 2016, : Cristiano Ronaldo, Messi, Griezmann, Pogba... Le classement complet". France Football (in French). Retrieved 2016-12-12.